Can You Reheat a Pie? | Can You Reheat? Q: I have some leftover pie that I want to warm up and serve, but I’m worried that reheating it will make the crust a soggy mess. Can you reheat a pie? 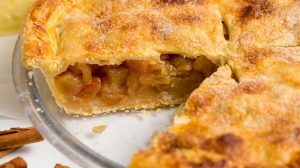 If so, what is the best and safest way to reheat pie without drying out the filling or ruining the flakiness of the crust? A: Reheating a pie while keeping it crisp and delicious is easy to do, and your crust can stay as flaky as the first time you served it. While there are a few ways to go about reheating a pie, in a toaster oven, a regular oven or a microwave oven, you will get the best results in a toaster oven or regular oven. Microwaving your leftover pie can work if you have no other choice, but it is a last resort. Be sure to let us know which method you try and how it works out. The easiest and most reliable way to reheat a pie is in a toaster oven or a regular oven. All you need to do is preheat the oven to 350 degrees, cover the pie loosely with foil to keep the crust from burning, and pop it in the oven. Removing the foil for the last few minutes will help keep the crust crispy, light, and flaky. The amount of time it will take to reheat the pie depends on the size of the pie, the thickness, the type of pie, and whether it is frozen, refrigerated, or room temperature. If the pie is room temperature, it will take about 10 to 15 minutes to reheat it. If it is in the fridge, give it another 5 minutes. If it is frozen, you will need to reheat it for at least 30 minutes or defrost it in advance. If freeze your leftover pie, be sure to double wrap it in plastic wrap and put it in a freezer bag to protect it from freezer burn and odors. To test if your pie is warm enough in the middle, stick a knife in the middle and then carefully check to see if the knife is warm to the touch. Allow the pie to stand for 2-3 minutes before serving. Using this method for reheating a pie should keep your crust crisp and flaky without drying out the filling. Can you reheat a pie in a microwave oven? Reheating your pie in the microwave is not the recommended method, because the crust tends to absorb liquid from the filling and lose its flakiness. However, if you have no other choice, it can be done. The best way to heat pie in the microwave is to put it on a microwavable plate, cover it loosely with wax paper or paper towels or place bunched up plastic wrap on the top of the pie leaving the edges uncovered. Use the reheat setting on your microwave or heat it in 30-second intervals until it reaches the desired temperature. Letting it sit covered for a few minutes will help evenly distribute the heat throughout the pie. While it is perfectly safe to reheat pie, there are a few things to watch out for. Remember that you should never put a metal pie pan in the microwave, and you should not refreeze a pie after you have reheated it. Also, don’t try to reheat a cream pie. They are meant to be served cool. Finally, remember to top off that slice of steaming warm pie with a scoop of cold vanilla ice cream for an extra delicious treat.